There are many signs that extraterrestrial beings, often called gods, periodically intervene in the evolution of life on Earth. Some of the most enduring signs like the Great Pyramid have convinced me that Stone Age humans under Old Kingdom Pharaohs did not build many of the most ancient and most enduring megaliths. Our world view of the Great Pyramid is shaped by the Egyptologists, the liberal media, government teachers, parents etc. Studies by many New Age scholars have convinced them that the Great Pyramid was not built by the Pharoah Khufu as a tomb. Historians note that it is devoid of authentic inscriptions, unlike later pyramids which contained extensive religious inscriptions about their builders. The so called coffin found in the Kings Chamber was carved out of one piece of solid granite, including the cover. It is too large to have been transported into the pyramid, so like the enigmatic air shafts which point to Sirius and Orion, this most massive of all the world’s stone structures was built around these internal features. Machinists have found tool marks like those made by modern saws inside this coffin. Robert Bauval and Adrian Gilbert in “The Orion Mystery: Unlocking the Secrets of the Pyramids” have used many good photos and illustrations to help convince me that the Great Pyramid is a prehistoric machine not built by prehistoric humans. As an engineer, I recognize the following photo as a very strong solid granite foundation for a heavy machine creating a very large downward force. Well over 5000 years old, all iron parts of the machine would be long gone. This foundation cut into a huge block of granite was not made using stone age tools which is all that was available in Egypt at the time of Khufu, about 2500 BC. 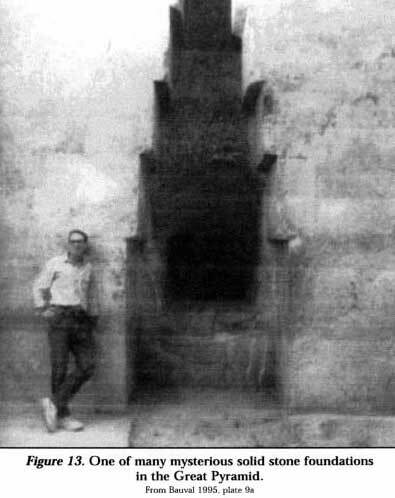 Like the Sphinx, Bauval and others think the Great Pyramid is over 10,000 years old. The bottom of the pyramid was solidly and precisely set into solid bedrock. My theory that it was used to move a tectonic plate is way out, but closer to the truth than the myth repeated again and again by Egyptologists. Those of you who think that survivors from Atlantis built the Great Pyramid are also closer to the truth, since Atlantis was ruled by extraterrestrial gods, like Poseidon..
enigmatic Giza pyramids are aligned the same as the three stars forming the belt of the constellation of Orion, the sign of Osiris, the most important of the early Egyptian gods. Ancient Egyptian hieroglyphics record the extensive preparations for the Pharaohs to make the dangerous journey to join Osiris in Orion. 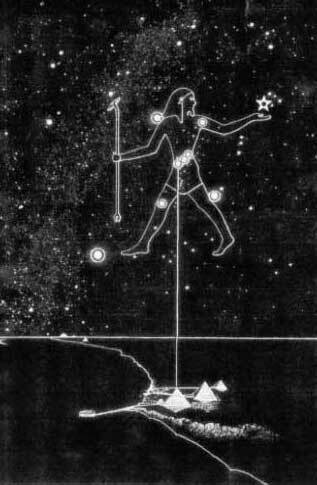 The illustration below shows that Al Nitak corresponds to the Great Pyramid. The Egyptian god Thoth taught that as in heaven, so on earth. The gods are pointing to Al Nitak and Sirius for reasons now known only by the gods. Using Archaeoastronomy, Bauval calculates that 10,450BC is the time when the Orion belt and Al Nitak are lowest on the horizon. That is also the date with the best match between the orientation of the Giza Pyramids and the Orion belt stars. Later in this article, I will suggest that this “Earth in Upheaval” age and start of the Mayan Third Age of Man is one of the last three times the gods have visited Earth in mass. Plato and Cayce recorded that 10.500 BC is one of the date of the destruction of Atlantis. Physical and mythical signs have convinced me that extraterrestrial gods periodically intervene in human physical and cultural evolution. Next I will discuss the location of the most important of the extraterrestrial signs, a great circle thru Giza that once was the Old Equator. The more I study this enigmatic great circle, the more I am convinced that these sacred sites are important signs from extraterrestrial gods who periodically visit Earth. They were planned by the gods, and many megalithic structures like the Great Pyramid were even built by the gods. Alison is an expert on geography and geometry and he loves the accuracy with which some ancient architect laid out these sites. What Alison now calls his line of ancient sites is the great circle which I still call the Old Equator. Jim Alison calculates the pole of his great circle as 59 degrees 42 minutes N and 139 degrees 17minutes W, located in Alaska’s Yukon. This is about a 30 degree shift from 90 degrees N, the current location of the North Pole. The following table from Alison’s web site last year calculates the precision of the alignments. 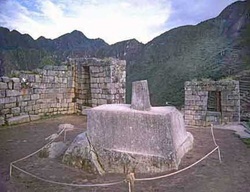 The Great Pyramid, Petra and the ancient Nazca Lines are located dead on the Old Equator, or 6,215 miles from the pole. Most of Alison’s sites are within ten miles of this ley line, surely the most impressive of many ley lines (10/6215 <<1%). Accuracy like this is not accidental but is well planned by the gods, not by humans. It was planned by extraterrestrial visitors before the dawn of civilization. Gods make the signs and humans read the signs. Building stone monuments and measuring the Earth were important to the gods. As in heaven, so on earth. We will next take a journey around the Earth going east along the Old Equator. Starting from the Great Pyramid, we come next to Petra, lying just 3miles south of the Old Equator. Petra is a world heritage site in Jordan on an old caravan route between Egypt and Sumer. It is mentioned in the Bible and is sometimes called the Valley of Moses. Petra is south of Jerusalem, and most of the Holy Land lies slightly north of the Old Equator. In the fourth century B.C. 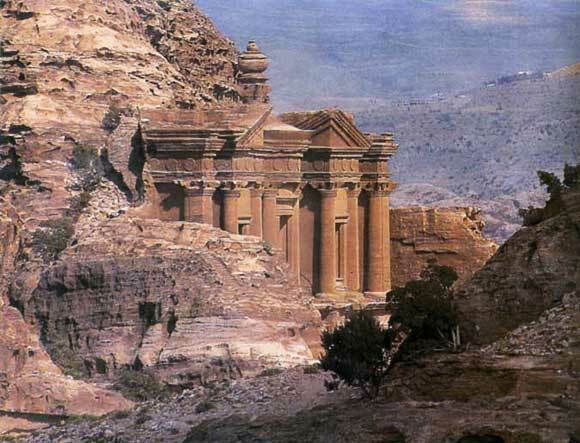 the Nabateans established a civilization at Petra. Petra is a dry and rocky place, and the Nabateans dug large cisterns in the solid rock. Water was a valuable commodity at this ancient crossroads, which also was located on an old north-south route between Arabia and the Mediterranean. In the first century B.C., the Nabatean Empire stretched from Arabia to the Sinai Peninsula and the Mediterranean, and included Jerusalem and Damascus. It encompassed what was Solomon’s kingdom and the Holy Land. Abraham, Moses, Jesus, Zoroaster and Muhammad all lived within a day’s donkey or camel journey from Petra. Some historians believe that the Garden of Eden was in Jordan, which was a rich river valley around 10,000 B.C. The main tourist attractions in Petra are its ancient and beautiful buildings, monuments, megaliths and an amphitheater, all carved into reddish-colored bedrock. “The ruins of Petra constitute one of the most extraordinary and fascinating monumental complexes of the ancient world, for the outstanding quality of the architecture and for the city’s remarkable position among ragged hills and narrow gorges. Petra is without a doubt one of the marvels of the world, one of those places that you will never forget”. ( Bourbon 1999, 6). The first photo below (ibid. 102) shows some of the beauty and the impressive way architecture is carved out of solid rock (Hammerton 1937, 88). The gods love to carve solid rock! We look forward to experiencing this ancient site and would not be surprised if some of the caverns and cisterns are much older than the Nabatean culture. 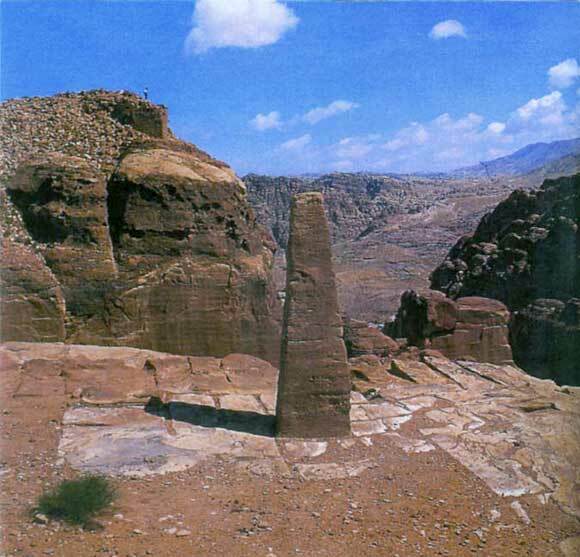 Now that we know that Petra lies on the Old Equator, archeologists should take a new look. In particular, we would like to know the age and exact location of an obelisk carved out of the top of a mountain peak, leaving a level foundation with two east-west markers. See the following photo from Bourbon 1999. Making markers the hard way consisted of removing 113,000 cubic feet of solid rock away from the obelisks. The more famous Hitching Post of the Sun at Machu Pichu in Peru was also carved out of solid rock on a high promontory and is located on the Old Equator! Alison calculates both markers to be 3 miles out of 6215 miles (0.05%), from his 2005 line of sacred sites. I look forward to the day when a New Age surveyor calculates a new Old Equator based on up to date Global Positioning Satellites (GPS) and these two mountain top markers. with backpacks and cameras make this impressive climb, but few bring saws which could cut off the top of a granite mountain. Petra with its unique carved buildings, amphitheaters, cisterns, caverns and especially its obelisks is so sacred to me, that I hesitate to tell you more. It is one of the major sacred sites on earth, pointing to the gods in heaven. He who has eyes to see, let him search for more truth at Petra. The next ancient site on the Old Equator is Ur, in Sumer near the mouth of the Tigris and Euphrates rivers. Ur is one of the oldest cities in the world and contains the oldest significant Ziggurat or Step Pyramid. 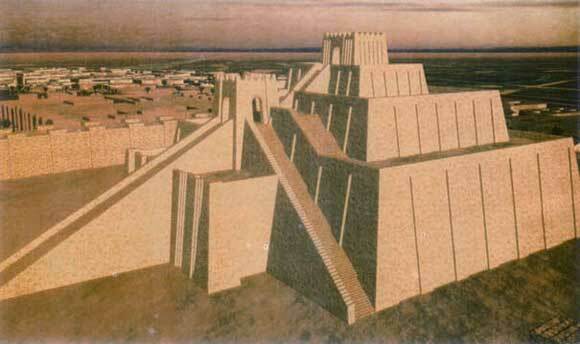 The Ziggurats were Sumerian temples and known as the homes of the local god and priests. As centuries went by, new temples were built on top of older Ziggurats. The following Figure shows a computer reconstruction of Ur’s most impressive Ziggurat (Forte 1997, 93). Ur is the first city known to have extensive indoor plumbing and sewers, long considered to be a mark of civilization. Some of the oldest bronze tools, wheels, and bronze foundries have been found in Ur. One of the oldest cuneiform tablets found in Ur is the earliest record of a king. The Bible says that Ur was the home of Abraham. The following photos (Davidson 1967) and (Hammerton 1937) show how civilized Ur was in the third millennium B.C. Artistically, these photos from about 2500 BC look more civilized than most musical instruments and ornaments from current third world kingdoms. They also are signs of trade from distant lands for gold, silver and rare minerals. Sumer was home to some of the world’s first professional craftsman, including artists and musicians. 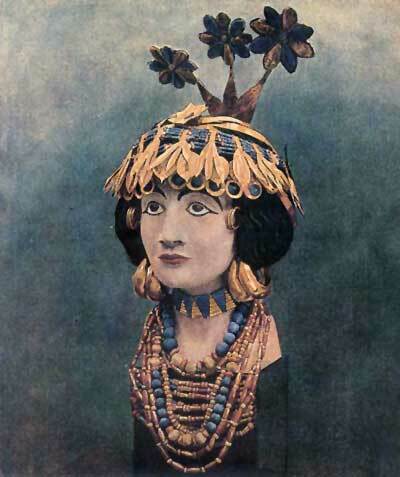 It was home to the first known kings and they had a very high regard for women. 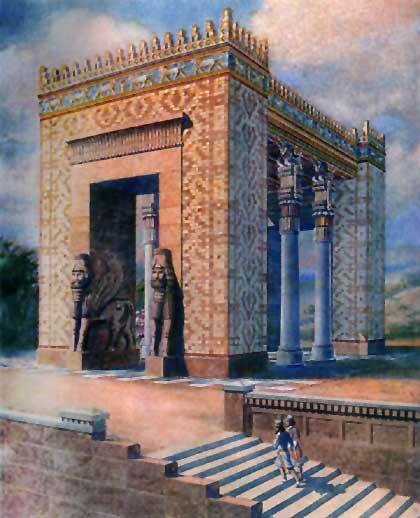 The ancient Sumerian heaven-and-earth god, Ea, later called Enki, first brought civilization to man in nearby Eridu, which appears closer to Alison’s line of sacred sights than Ur. The following long quotation from Sitchin says that the ancient Sumerians believed that Eridu was a very important old city. “There was a time, the Sumerians told, when civilized man was not yet on Earth, when animals were only wild and domesticated crops were not yet cultivated. At this long-ago time (710,000 B.C.) there arrived on Earth a group of fifty Anunnaki (children of the god Anu). Led by a leader whose name was E.A. (meaning whose home is water), they journeyed from their home planet NIBIRU and, reaching Earth, splashed down in the water of the Persian Gulf. Their first task was to drain the marshes and clear river channels, check out food sources (found to be fish and fowl). They then began to make bricks from the clay of the soil and established the first-ever settlement on Earth by extraterrestrials. They named the habitat ERIDU, which meant Home in the Faraway or Home away from Home. The name is the origin of the name Earth in some of the oldest languages” (Sitchin 1998, 42). The above Sumerian story was found in writing, but the subject was pre-diluvial history. “After the Deluge, the Sumerians rebuilt the ancient Anunnaki habitats into cities for humans and their gods. The first one to be rebuilt was Eridu, Enki’s city; and it was there, we believe, that the momentous decision to grant mankind civilization was made; the time, archaeological evidence shows, was circa 3800 B.C.” (ibid. 187). Most scholars agree that the Sumerians had the first civilization with city-states, kings and priests. The Sumerians claimed Eridu was their first city, both before and after the Deluge. They worshiped Anu and his children, the old heaven and earth gods. The Old Equator may go right through Eridu in southern Sumer. Eridu is not as impressive today as nearby Ur, which is larger and was built later than Eridu. Both written history and archaeological records say Eridu was destroyed after 3000 B.C. by warring kings and gods. You have to dig down more than five thousand years in ruins to find traces of the first civilization, but nowhere on earth have they found older written records of gods, kings, priests, scribes, teachers, dancers, musicians, craftsmen, merchants, engineers, sailors, mathematicians, astronomers and astrologers. Practical implements such as plows are more common in early artifacts and writings than weapons and war. The oldest written documents are usually related to property records, commerce and numbers. The world’s first wheeled vehicles were donkey carts, not chariots. The Sumerians invented both two-wheeled and four-wheeled vehicles. Did they have help from the gods? Written historical records clearly said they did. Modern political correctness says that God is wholly other, manifest only through Jesus or Mohammed. The evidence points to an improbable change in mankind around 3100 B.C., and it occurred along an even more improbable great circle. The Sumerians wrote their history down in the world’s oldest clay tablets, documenting that the sons of Anu from Nibiru came out of the water and taught them the arts of civilization. .. Originally the disk or globe symbolized Nibiru, Anu’s home planetoid. Note the cobras in the second “winged disc”, symbolizing a feathered serpent, the major name for several native American gods, including Quetzalcoatl. 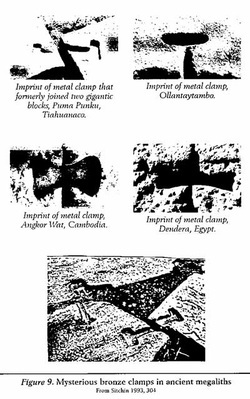 These symbols were found in royal tombs and documents thru Asia Minor, Egypt and nearby countries. 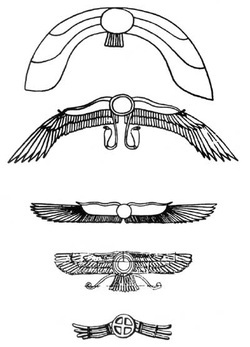 They originally symbolized the flying planetoid Nibiru and its high god Anu. Later, similar symbols were used for other celestial gods such as the sun god. Many very historical pharaohs and kings used these symbols to remember ancient gods who flew to earth from heaven. Continuing east on the Old Equator we cross the Zagros Mountains, where scientists find the origin of emmer, wheat, barley, grapes and olives over six thousand years ago. New Age scholars like Sitchin have helped convince many of us that it is very difficult to domesticate plants. There are major genetic differences between wild wheat and domesticated wheat. Why would struggling hunter gatherers spend hundreds of years collecting large seeds with special stalk properties for an inedible seed. No other ape eats grain! Centuries later humans somehow learned how to make beer and bread. Even then, how did clan chiefs protect wheat seed thru a severe winter? Domestication of plants is a major sign of extraterrestrial intervention! Note that grapes also made enigmatic giant leaps forward in size and quality, especially for making wine. I think that extraterrestrial gods helped the Zagros Mountain hunter gatherers make beer and wine. Since the dawn of history in America, gods have helped shaman find mushrooms and psychedelic roots in order to better communicate with the gods. It is harder to trace the domestication of animals, but the oldest signs of domestication of sheep and goats are near the Old Equator and the Zagros Mountains. Dogs may have been domesticated in India, but more research is needed. Will Hart in “African Genesis: Our Extraterrestrial DNA and the True Origins of the Species” makes convincing arguments that humans have never domesticate the grey wolf Canis lupus. All dogs are descended from the grey wolf and can breed with them and have viable pups. This means that dogs should be in the species Canis lupus and not Canis familiaris. Hart reminds us that we can tame many animals like tigers, zebras, elephants and wolves, but we do not have the ability to domesticate them. Domesticated animals have smaller brains and are dependent on humans. Some night when you cannot sleep, ponder the domestication of humans and dogs. Homo sapiens have a smaller brain than Neanderthal man. Did Anubis domesticate the Egyptians? Did dogs domesticate humans? At the start of the Mayan Third Age of Man, Neanderthal Man and Homo erectus were extinct and all humans were of one species, Homo sapiens. Since evolution usually drives for diversity, the evolution of one species from many is rare. The Cataclysm that smote the northern hemisphere left few humans surviving north of the Old Equator. By the Fourth Age of Man we find an immigration of new hunter gatherers into the Fertile Crescent and the Zagros Mountains. Some signs of dogs or tame wolves appeared, but humans were few and struggling, mostly living in caves. Big game was very scarce. By the start of the Fifth Age of Man, the domestication of plants and animals, intensive farming using irrigation, writing, bronze, and the wheel had changed civilization forever. 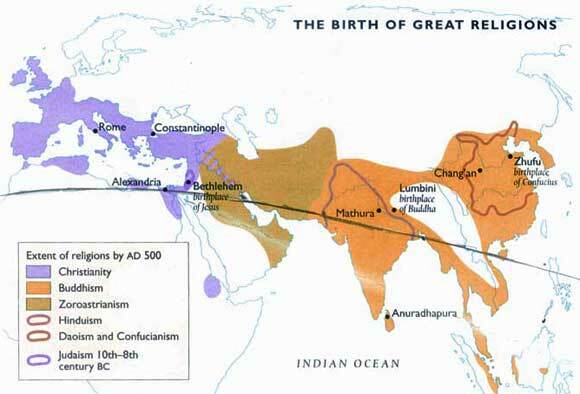 All this happened near the Old Equator within about 5000 years with less humans than the population of Iraq. Did the humans have help? Note that most of the Homo sapiens on Earth before 3114 BC lived south of he Old Equator and show very few signs of civilization. The next sacred site on the Old Equator is Persepolis, the ancient capitol of Persia. Persepolis was the home of Xerxes, Cyrus and Darius, powerful kings of the Persian Empire. 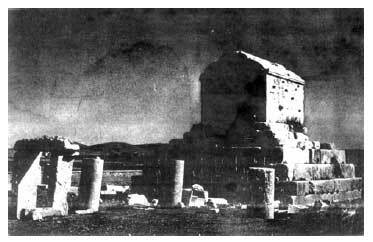 The tomb of Cyrus was a step pyramid using huge white limestone blocks. The lowest step was the height of a man. 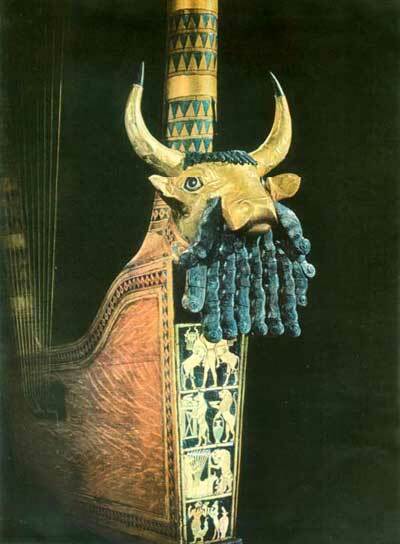 Many monuments from Persepolis are well preserved and very impressive, like the following ancient monument to Xerxes. Persepolis ( on the left) is also the home of Zoroastrianism. Zoroaster was a major prophet of dualism; good versus evil, right versus wrong, light versus darkness, life verses death and truth verses falsehood. The good lord and his good spirit are involved in a long struggle against Satan and the evil spirit. Zoroaster believed in divine cycles or ages lasting three thousand years. Note that the Sumerians believed in divine cycles of 3,600 years. Zoroaster lived about 1000 BC and believed that humans had to help his good lord vanquish evil. He was a major influence on Babylonian, Jewish, Christian and Muslim views of the Apocalypse. Zoroasters’s “good spirit” evolved into the Judeo-Christian concept of the Holy Spirit after the Babylonian exile. Traveling east along the Old Equator we get to Mohenjo Daro in the Indus River Valley. There is evidence here of a well-organized agrarian society with few monuments or records. 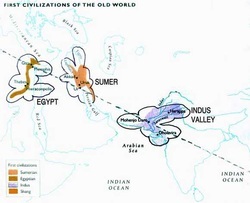 Dating to the middle of the third millennium B.C., similar to the Old Kingdom in Egypt, the Indus Valley civilization is usually considered the third oldest civilization, behind Sumer and Egypt. Is it a coincidence that the first three major human civilizations lie on the Old Equator? 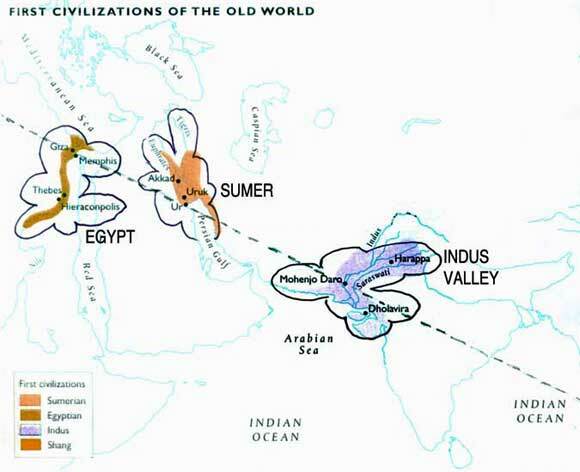 The Indus Valley civilization is less impressive than Sumer or Egypt, but it was a well-planned city with centralized plumbing, sanitary sewers and central baths. 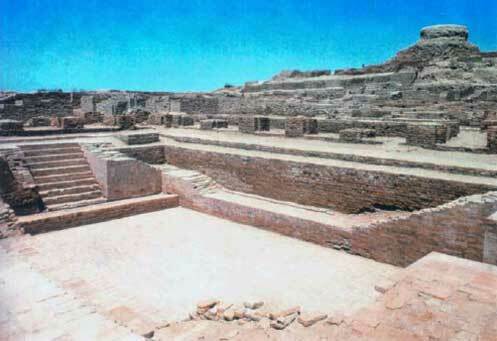 The Mohenjo Daro water and sewer system included large communal baths and was more advanced than many third world cities today. Following is a photograph of the Great Bath at Mohenjo Daro (McIntosh 2001, 67). The ancient architect of the sacred sites on the Old Equator must have used the same sexadecimal system that Enki taught at Eridu, because most of the intervals between sacred sites are 36 degrees or some other multiple of 6. Mohenjo Dare is 36 degrees east of the Great Pyramid. Traveling another 36 degrees east of Mohenjo Daro we come to Angkor Wat, the impressive ancient capital of Cambodia. Angkor Wat is the impressive temple complex of 72 (36×2) temples built by the Chimeras in Cambodia around 1000 A.D. One of the most common of many elaborate stone statues are those of the Naga gods, usually pictured as a cobra snake with five or more heads. Many statues show the Buddha protected by a Naga cobra god. Hancock writes: “In Indian mythology the Nagas are supernatural beings, cobra-kings, who rule on earth but are ranked amongst the gods. They are shape changers who can appear, at will, as fully human or as hybrids, human above the waist and serpent below”. (Hancock 1998, 134f). Hancock and others have found that many of the chamber temples are located in a pattern similar to the constellation of Drako, the heavenly serpent. There are many similarities between Angkor Wat and Egypt. The cobra-kings are similar to Egypt’s horus-kings. They both ruled before the dawn of history. Another striking similarity between Angkor Wat and the old heavenand- earth gods of Sumer is the belief in cosmic cycles or ages. The Chimeras, like the Hindus, believed that we are living in the last of the ages of man in the current cycle of creation. This last age began in 3100 B.C., close to the time of the Mayan’s fifth sun and the last visit of Anu to Sumer. Continuing east along the Old Equator we cross the South China Sea and move into the Pacific Ocean. The Old Equator goes thru the highlands of New Guinea, an isolated Island of growing interest to both geneticists and cultural anthropologists. Homo sapiens have been in Australia and New Guinea for more than thirty thousand years, much longer than in America. Native Australians remained hunter-gatherers for the entire time, while farming evolved in New Guinea. In fact, New Guinea farmers or their gods first developed their own varieties of the banana tree, taro, yam and sugar cane around 7000 B.C. The earliest and most intensive food production, and the densest populations, of Greater Australia arose in the highland valleys of New Guinea at altitudes between 4,000 and 9,000 feet above sea level. Archaeological excavations uncovered complex systems of drainage ditches dating back nine thousand years ago and becoming extensive by six thousand years ago, as well as terraces serving to retain moisture in drier areas. The ditch systems were similar to those still used today in the highlands to drain swampy areas for use as gardens. By around five thousand years ago, pollen analyses testified to widespread deforestation of highland valleys, suggesting forest clearance for agriculture (Diamond 1997, 303). New Guinea has a cultural evolution similar to that found in the highland valleys of Peru, which also developed new lands with canals and the terracing of highland valleys. The 7000 B.C. date is close to the 7121 BC date for the start of the Mayan Fourth Age of Man. The Papuan languages found in New Guinea are unique in the world! Although Australia and New Guinea were one land mass during the last ice age, their natives are different genetically. Blood types in New Guinea are closer to the rest of the world than they are to the Australian Aboriginals. The mitochondria DNA in New Guinea come from a large number of unrelated female ancestors, not from an Australian population (Can 2003, 58). Don’t be surprised to learn that the Polynesians and Eastern Island natives are closely related to New Guinea natives. Around 1200 B.C., seafaring farmers from the Bismarck Archipelago ventured east into the wide open seas of the Pacific with its many islands. If they traveled along the Old Equator, a route that Enki planned, they would come to Anatom Island, 72 degrees east of Angkor. We note that the precession rate of the stars is one degree in 72 years, and 72 is a hexadecimal number built into both the Great Pyramid and Angkor Wat. Anatom Island is the most southern island in the new Republic of Vanuatu. Stone ruins there once housed the largest missionary church in the southern hemisphere. on immense stone platforms. The statues are not the only sign that a large civilization once existed on the island. Legend has it that the original three canoes that settled Easter Island in the fourth century A.D. included scribes who could recite the sacred words on fifty-seven wooden tablets. Like most legends there is some truth here because twenty-four ancient tablets have been found with hieroglyphic script similar to the symbolic scripts of Egypt and the early Indus Valley civilization. Another great mystery is that the Easter Island hieroglyphics have not been deciphered to date. It is different than any other written language. Why did the gods like to invent and scatter new languages along the Old Equator? Are they signs?Hancock writes about the mystery of how seafarers in canoes could navigate the awesome South Pacific to find remote Easter Island. The mystery also concerns a people who must already have possessed a well-developed tradition of architecture and engineering when they arrived at the Naval of the World for there is little trace of experimentation and trial and error in the execution of the great Moai. 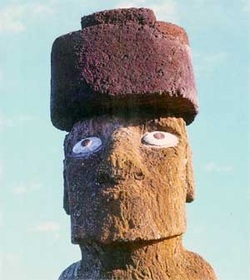 On the contrary, the consistent and carefully thought out artistic canon expressed in these unique works of sculpture appears to have been fully elaborated at the beginning of Easter Island’s remarkable statue-making phase with the best Moai often being the earliest ones. (ibid. 226). 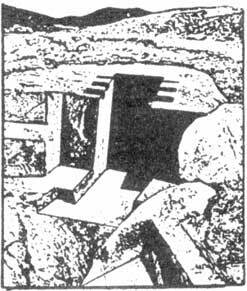 The architecture Hancock refers to includes sturdy walls and platforms containing many megaliths and atlars. Scholars theorize on how the natives moved these huge megaliths. The natives themselves said Manna, or sorcery, moved them. The people carved the statues in quarries, but the god kings moved them, often through the air. One tradition is that the original natives came from a far away island on three canoes. Another tradition is that they came from heaven in a ship. He (the god king) came down from heaven to earth. To both earths did Hotu-Matua, returning with the help of heaven to both worlds of his eldest son, to both worlds, to his world. He came in the ship of his youngest son, his best son, came to earth from heaven. (ibid. 245f). As in almost all the ancient sacred sites, there are many astronomical orientations. In Easter Island many alignments are solar, like the equinoxes and the solstices. Native traditions speak of a brotherhood of learned men who studied the sky. The middle of the Pacific Ocean is a good place to observe the stars. The islanders called their island Eyes Looking at Heaven, a common motif for the statues. We have credited Alison for his precise location of the Old Equator, but Hancock and other scholars paved the way. 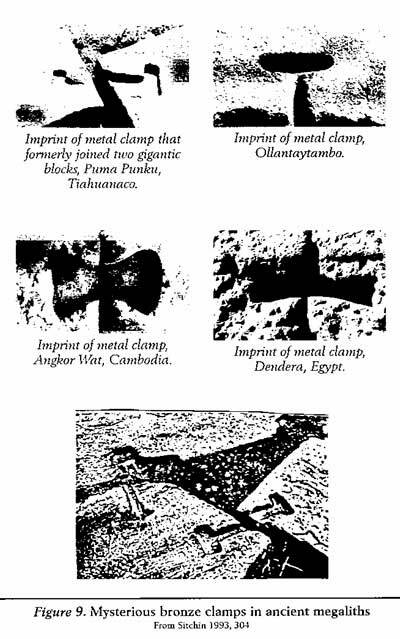 The similarities between Easter Island, Angkor Wat and Giza include old naval of the earth themes with many “omphalos” or naval of the Earth stone symbols. Authorities like Peter Tomkins, who worked closely with Stechini and John Michel in his important study At the Center of the World also present compelling evidence that a network of centers, in constant communication with one another, did once exist, spread out widely around the globe (ibid. 253). Centered around Egypt, the above scholars identified geographical naval of the world and stone navels marking important meridians and parallels. 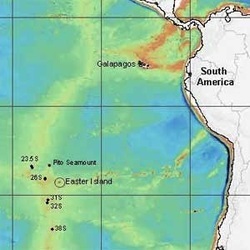 Alisons’ studies to date have located Easter Island once and for all as a prominent location on an old important grid. Not only is it located on the Old Equator, but it is located exactly 180 degrees east of where the Old Equator crosses the Indus River Valley. In other words, if you drill a hole from Easter Island straight through the center of the earth, you come out in the ancient Indus River Valley, the location of another undeciphered script. There are only a handful of undeciphered scripts on earth, and two of them line up through the center of the earth. Easter Island is also the location of an enigmatic “Hot Spot” which form rows of volcanoes. It is also located above one corner of the Nazca Tectonic Plate, the plate used to form the Andes Mountains (See my Essay on Intelligent Design). Some Archaeologists think that the many immense stone foundations predate the Moai statues. We agree, since the following Martin Gray photos from Easter Island show ancient walls with cut stone like we will later find at Machu Pichu in the Andes. 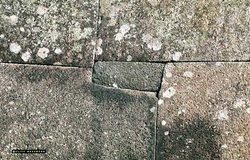 Most archaeologists see details like this small stone block in Peru and say the Incas made it using Stone Age tools and much patience. Since the Incas did not go to Easter Island, and natives today still use rock hammers to work stone, the above two photos from Easter Island are signs of extraterrestrials. Humans never built this very old wall! Easter Island is a very enigmatic sign that extraterrestrials visited Earth in prehistoric times. Continuing east along the Old Equator we come to the site of the famous huge pictures at Nazca Peru. 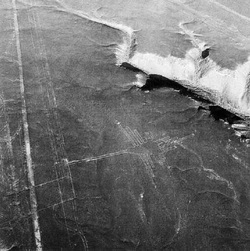 Here strange pictures and runways are visible from the air, but barely visible from the ground. Some of the figures are larger than a football field and can easily be seen a mile away in an airplane. Following is an aerial photograph of the Nazca Hummingbird (McIntosh 2001, 215). Some archaeoastronomers calculate that the Nazca ground figures mirror star constellations two thousand years ago. The images were made by scraping dirt and stones away to produce a subtle two-tone picture. For whom were these pictures made? Since they do not look like much on the ground, they were made for people with flying machines, like us or extraterrestrial gods. The Nazca coast of Peru had a rich culture long before the Mayans and the Aztecs. The gods left many signs in Peru, including many skulls with trepanned holes and/or elongated skulls. Flying due east for an hour brings us to one of the most sacred and mysterious sites in South America, Machu Pichu in Peru. Located high in the Andes Mountains, 2000 feet above the sacred Wilcamayu River, the ancient remains are pre-historical. On top of this granite mountain peak in the high Andes is an impressive prehistoric observatory and the sacred Intihuatana, the Hitching Post of the Sun. Like the mountain top obelisk at Petra, this structure was not built on top of a level granite peak, but it is actually part of the original solid mountain top. Many tons of granite were removed from around this functional hitching post for reasons known only by the gods. 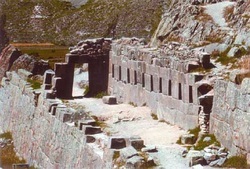 The wall in the background with the well built and well preserved trapezoidal window were added after the mountain top was leveled. Note the trapezoidal windows which have solar and celestial alignments as part of an observatory. 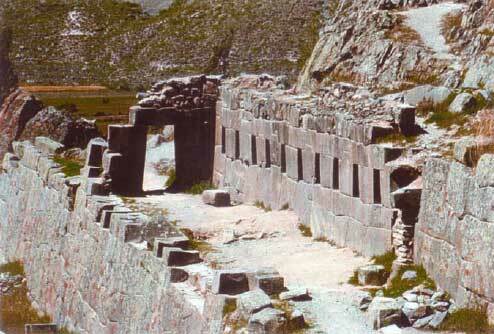 The following granite walls from the Machu Pichu mountain top are worth studying. 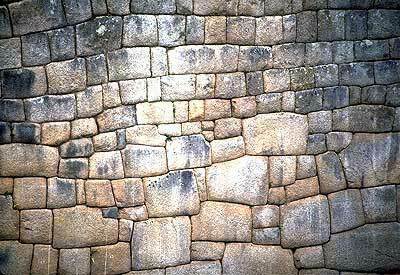 This ancient granite block was not built by the Incas or other Stone Age humans. 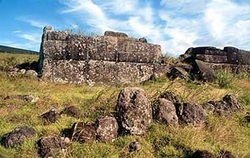 Analysis of the pink granite indicates that it was quarried high up on another mountain on the other side of the sacred Vilcamaya River (Forte 1997,276). Note that the whole wall looks pink, while the mountain is gray granite like the Intihuatana. Machu Pichu has attracted wide attention for its huge megaliths and precision work of stone masons, and also that it was hidden from western civilization for over 400 years. Huge megaliths were transported across deep valleys and precisely cut to fit tightly with other megaliths. It would be difficult and very expensive to duplicate this workmanship using today’s tools. The oldest construction is much better than later additions. 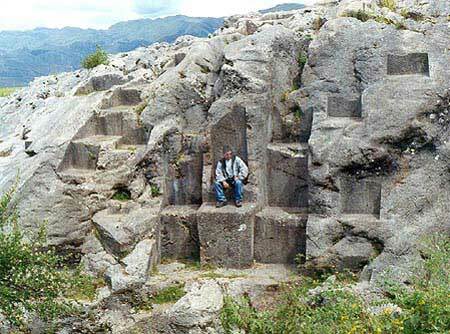 A few miles south of Machu Pichu lies Ollantaytamba, the second most impressive megalithic sites in South America. The next two Figures show an ancient megalithic structure, later used as a fortress. Some of the Ollantaytamba megaliths weighed 400,000 pounds. 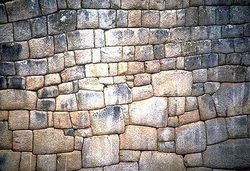 Not only is it impossible to make this cavity using stone hammers, but native Peruvians before Pizarro did not have the bronze technology to make these clamps. The Conquistadors never made it up to Machu Pichu, which is well hidden from the river valleys. Of about a dozen similar enigmatic bronze clamps that I know of, all are within walking distance of the Old Equator, the furthest being near Lake Titicaca, near the Peruvian Andes. 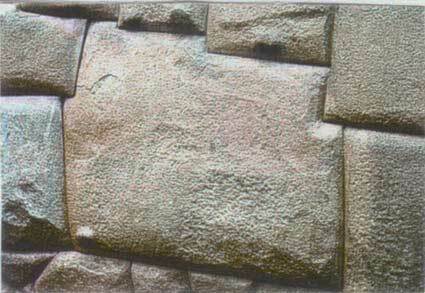 The following photos of ancient Peruvian solid stone foundations are also not of human origin. Opening to underground shelter or foundation? Both photos show impressive foundations carved into solid granite bedrock. I am probably the only engineer who thinks that they were used to literally move mountains or tectonic plates. . Traveling east from the Peruvian Andes we cross Brazil and the mouth of the Amazon River. Satellite photos indicate many ancient canals along the Amazon River, and just recently an ancient canal has been found on the Old Equator near the mouth of the Amazon. The Old Equator crosses the Cape Verde Islands, halfway between Easter Island and the Indus Valley. Ancient maps indicate some occupation of the Cape Verde Islands. Will Hart, Jim Alison and I are among the minority of scholars who think Cape Verde was home to Atlantis. In 11,000 BC, the ocean was about 300 feet lower and the Cape Verde and Canary Islands to the north were much larger. The gods are very interested in time as well as space. They are especially interested in calendars and astronomical signs about space like the precession of the equinox, a very slow stellar event. The first two historical calendars date to about 3100 BC, the very dawn of history. The most accurate prehistoric calendar is the Mayan Calendar. If you are interested in Mayan calendars and celestial alignments, both of which point to the end of the Fifth Age of Man in 2012, look up works by John Major Jenkins. Most Mayan scholars agree with Jenkins that the last three ages of man started on 11,131 BC, 7121 BC and 3114 BC. I have previously mentioned that 11,000 BC is one of the preferred dates for the destruction of Atlantis and Noah’s Deluge. In 1997 Paul LaViolette published “Earth Under Fire: Humanity’s Survival of the Apocalypse” which calculates that a mass extinction of large animals on the northern hemisphere occurred around 10,750 BC. He also calculates that the black hole at the center of our galaxy reached its highest point on 10,890 BC. Like the Egyptologists, American Anthropologists are outdated. They still think that Clovis big game hunters with improved spears caused the extinction of most large mammals around 11,000 BC, including the mammoths, mastadons, huge bears, giant sloths, scinter-tooth tigers and saber-tooth tigers. 2012 will arrive before most anthropologists update their theories based on new scientific evidence, such as that referenced in the excellent 2006 book “The Cycle of Cosmic Catastrophes: Flood, Fire, and Famine in the History Of Civilization” by Richard Firestone, Allen West, and Simon-Warwick Smith. They will be surprised to learn that the Clovis big game hunters also became extinct around 11,000 BC. Cosmic missiles, probably comets and radiation from an exploding supernova were the probable cause of an earthly catastrophe that devastated North America and much of South America, Europe and Asia. Large mammals in Africa survived. Very few American anthropologists currently believe this enigmatic mass destruction to have an extraterrestrial cause, and no scientist could publish that this event was part of an Intelligent Design. Although scientists are still trying to figure out what caused the last mass destruction of large mammals, anthropologists agree that this mass destruction hurt the hunters and helped the farmers. The gods were preparing to introduce humans north of the Old Equator when they returned in 7121 BC. Remember that the Mayan Third Age of Man with the major cultural leap forward associated with the domestication of most plants and animals occurred near the Old Equator around 7000 BC. How did the Mayans know that the Fourth Age of Man started on 7131 BC and the Bronze Age started on 3114 BC? The Mayans, Toltecs, Zapotecs and the Olmecs all believed they could communicate with the gods using psychedelic drugs like mushrooms. 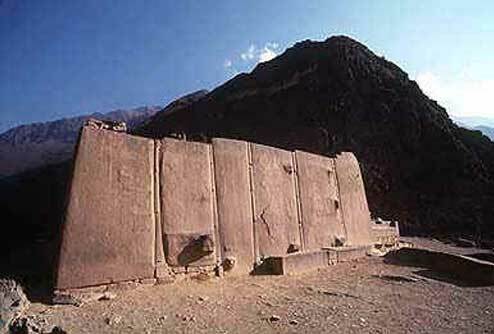 Since I now believe that extraterrestrial gods built statues, fabricated walls, built pyramids, and taught us languages, perhaps they also taught the Mayan Calendar to humans (See my Essay on the Mayan Ages: http://www.cloudriderbooks.net/essays.html ). The end of the Fifth Age of Man ends on December 21, 2012. UFO abductees report that extraterrestrials are using humans to help breed many hybrids. Note that the grays etc are not gods. We will know them when the gods arrive in power. Estimates of the number of hybrid babies range from one thousand to one million. Human genes will dilute the hybrid genes long before the Second Age of Aquarius unless:1). the hybrids are a new species, or 2). most Homo sapiens are removed from the path of the new hybrids. Both the Mayans and the grays warn of earthquakes and mass destruction. The abductees are often shown an Earth split in two. My knowledge of evolution and history says that extraterrestrials use mass extinctions for both physical and cultural evolution. Perhaps extinction will again occur north of the Old Equator, civilization on the Old Equator and preservation of humans and other large mammals will continue south of the Old Equator; He who has ears to hear, let him hear!